island shorelines that are eroding around the lake. The islands that dot the landscape all over Lake Lanier contribute to the lake’s natural beauty. When the lake is at full pool, or 1,071 feet above sea level, there are approximately 160 visible islands. The islands are many lake visitors’ paradise, with many favorites claimed early on popular summer weekend days. With growing concern, LLA has recognized that many islands that do not exist in their full glory anymore. Overuse and erosion have stripped them of their beauty, transforming them into hazardous areas. While shoreline erosion is a natural process, the increase in Lake Lanier’s boating activity has sped the erosion process, causing significant shoreline loss. Not only does erosion cause a safety hazard for boaters, but erosion also leads to increased siltation. As silt builds up on the bottom of the lake, it effectively reduces the lake’s water storage capacity. 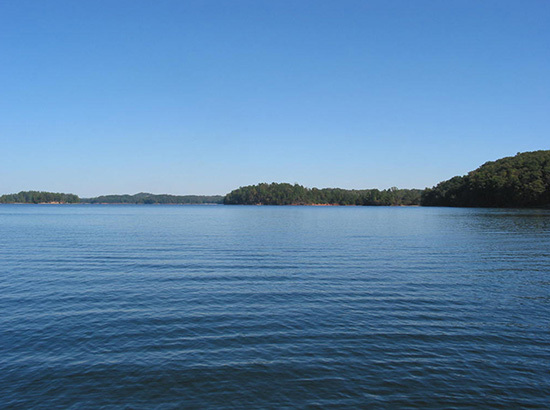 Lake Lanier provides water for over 4 million residents in North Georgia, so any reduction in the amount of water the lake can hold is a serious concern. Lake Lanier Association’s first project dedicated to reducing shoreline erosion was completed in January 2015. LLA targeted the most exposed area on one of the well-known “three sisters’ islands” as its first worksite, then planned and funded the installation of 800 tons of rough-cut granite – Rip Rap – over 500 linear feet of shoreline. Following this first successful project, the Army Corps of Engineers issued LLA permits for additional island shoreline rip rap projects. These projects began in October 2016 and are set for completion by March 2017. When finished, the project will have installed 6500 tons of stone along the shore of 3150 linear feet of four additional islands. LLA intends to continue the Rip Rap projects into the future, raising funds, negotiating CoE permits, planning and installing stone, all for the purpose of preserving the islands across the lake.